Five old Saules… the second part. 2006. 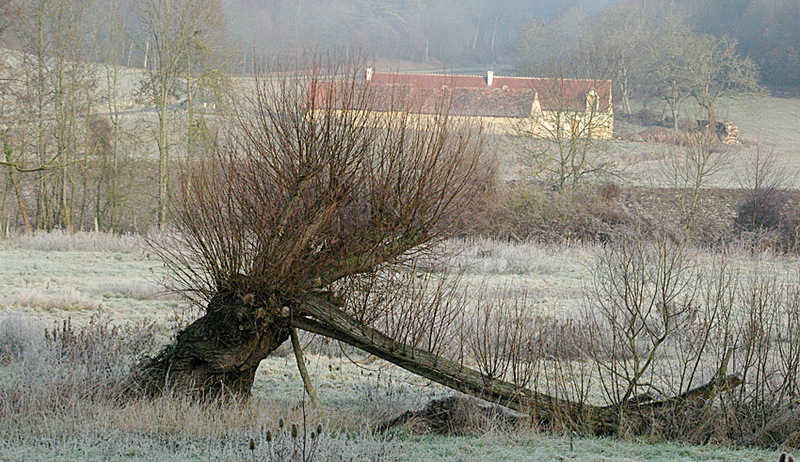 The first willow to be attacked… as it was left in 2005. You can see the healthy new rods that have grown during the previous twelve months. As I said in the December post [almost a year ago] we started by pollarding the big pollards already on the site. The plan was to tackle them as ‘one a year’…. but that slipped away after the first attempt with bowsaws. 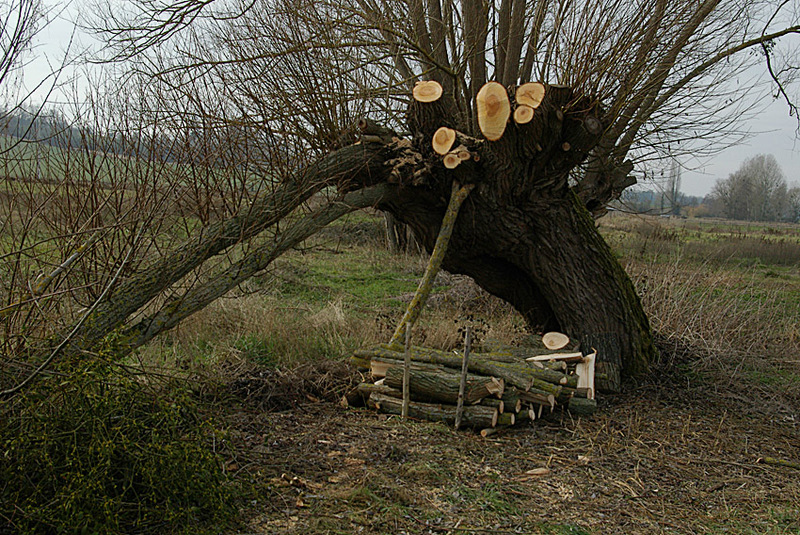 The first tree, once cleaned up, with wood stacked underneath.The branch underneath, leaning against the trunk is not supporting the tree...The tree lifted towards the upright and the branch fell away. 2006 saw us ‘armed’ with a chainsaw. That meant that we were able to tidy up the wreckage of the first attempt and finish the tree off properly. The cut timber was then processed and we took some of it up to the hangar [dutch bar/open barn] to dry out for use as firewood. The usable rest was stacked at the base of the tree. We then tackled a second tree, the smallest and weakest specimen. That way we were keeping to the original one a year plan! Two views of the weakling - halfway through and after.In the background of the first picture the maintenance tasks can be seen lurking. 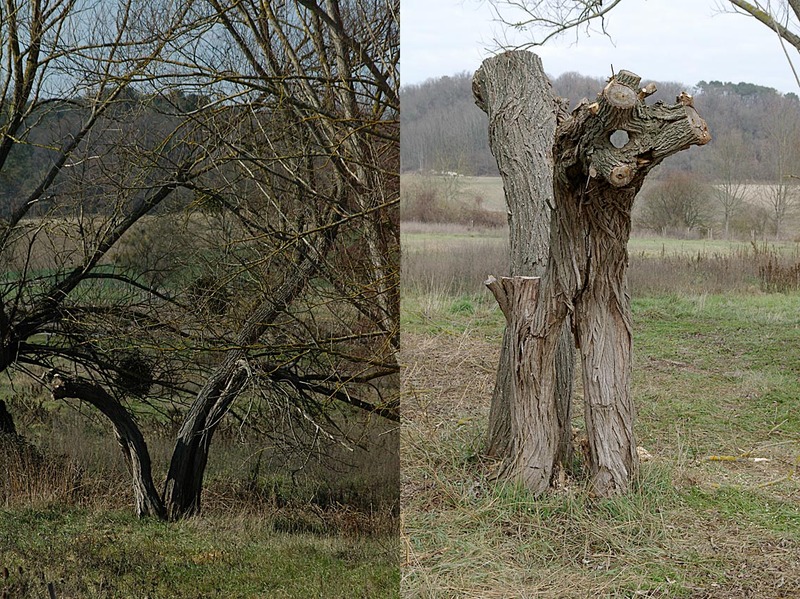 Some essential maintenance followed on the remaining three trees…. cutting down dead branches and ones that were left unprotected as a result of the other work done. As we were less than halfway through the stay, and the fact that [a] the cut ends from the previous year had produced good growth… and [b] the maintenance work on the third tree in the line had left only three good trunks coming up from the head… we decided to do a full job on that one too. First three trees pollarded.... hope for the weakling was faint!The final tidying up on the fifth tree is yet to be done. In 2005 an attempt was made at planting up with first/second year growth from the top of the tree…. what a waste of time that was. 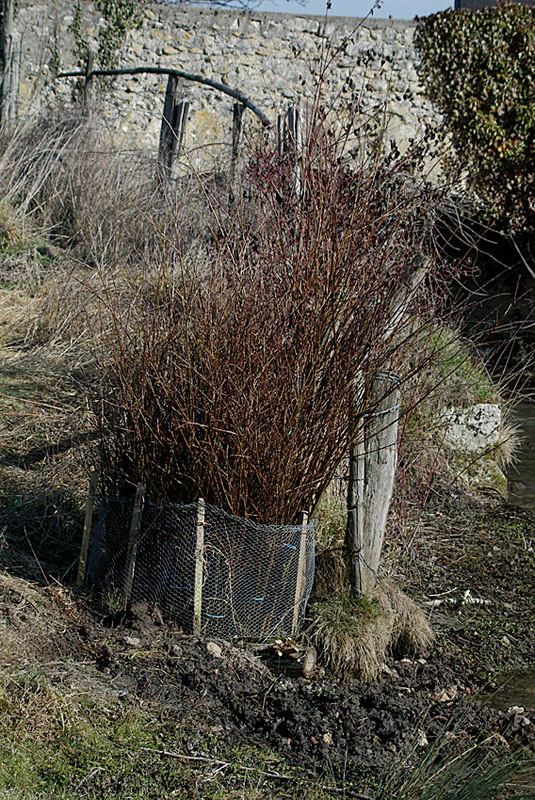 We planted 100 little twigs… half at the end nearest the wier and the rest in the corner by our neighbours etang and the Aigronne. We had six survivors at the wier planting…. and two at the lake end. Eight percent success rate! Or should that really read… 92% FAILURE rate? However, in 2006 we took a different tack. There was plenty of really healthy first year rods to be harvested from the untidy ends that we’d had to leave in 2005. We cut these off before tidying the ends and finishing the pollarding of tree one. There were over one hundred and fifty one metre to two metre rods. We placed these in a ‘holding pond’, hastily constructed at the side of the bief, whilst we concentrated on the pollarding. Rods stacked in the holding pen before planting.This kept them wet and safe from being trampled on. Armed with this knowledge, Stuart and I planted fifty of the rods in a block next door to the thriving cuttings. Most of the rest were planted at the lake end, in the original block and a group of three opposite… next to the bief [to start the tree line]… and at the wier end. 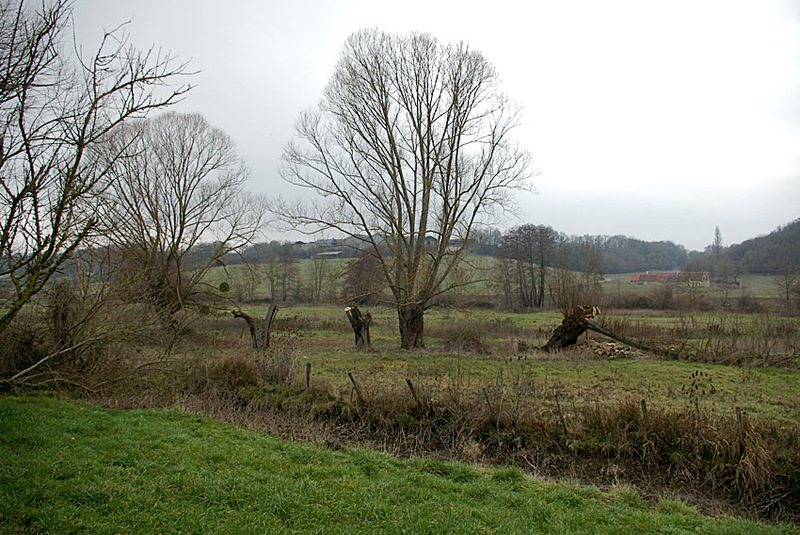 The last few were lined out along the ditch that leads up from the Aigronne towards the bridge… and a small clump planted between the end of the ditch and the bridge. As I will tell in the next posting… we had more success from the healthier, longer rods. ← Ooooo! 2011…what a busy year!